For fans eager for more Simpsons beyond the offerings on Fox and in broadcast syndication, finally some good news – but it comes with some strings attached. After two decades, The Simpsons are finally coming to cable in a $750-$1 billion mega deal with recently-launched FXX, 21st Century Fox’s new cable channel targeted to younger audiences in the 18-49 demo. The deal includes all future and 522 existing episodes of the series, dating all the way back to the series’ premiere on December 17, 1989. Running for ten years, the deal also gives FXX exclusive digital, VOD (video on demand), and SVOD (subscription video on demand). FXX begins airing the episodes in August 2014, paying for the show on a “per-week” basis, as opposed to a “per-episode” basis. FXX can be found in channel positions where Fox Soccer Channel used to be. For example in Chicago, FXX can be found way up there on channel 401 on Comcast systems. The Simpsons had been the last major holdout, as most off-network sitcoms and dramas are available on cable. The animated sitcom had been tied for the last two decades to a contract struck with stations in 1993 as the show was sold with syndicated exclusively protection – a norm at the time, keeping it off cable and superstation outlets. The Simpsons was sold without a hard cap, meaning the contract was in effect as long as the series continued on Fox. Twentieth apparently tweaked its contract with local stations in order to get a cable sale. The first sign came in September when Twentieth allowed Fox-owned stations in five markets (including Chicago) to move some Simpsons airings to their sister My Network TV counterparts as primary Fox stations are expanding their news and first-run programming. Indeed, a few broadcast stations have either downgraded or stopped airing The Simpsons altogether as ratings have slipped and stations don’t have the time slots available anymore to run all the episodes. Markets where Simpsons reruns are not on the air currently include Louisville and West Palm Beach. For viewers in those markets, the cable and VOD deals comes as good news. But here comes the bad news (well, depending on your point of view:) FXX plans to vertically stack, or “marathon” episodes of The Simpsons on a few weeknights, meaning it won’t be “stripped”, i.e shown five or six nights a week in the same time slot or slots. The stacking strategy has worked for TBS with The Big Bang Theory, which “marathons” the series on Tuesday, Wednesday, and Thursday nights. Also, FX has also acquired the exclusive digital rights to the series, meaning they will be unavailable on Netflix, Amazon, or Hulu anytime soon (current season episodes of The Simpsons can be found on Hulu.) Instead, FX will make the series available through its new FXNOW app, which is expected to be unveiled on December 3. In the last few months, 21st Century – since being split from News Corp., has been aggressively been investing in cable with the launch of Fox Sports 1 (and 2) and FXX., since these days, cable is driving media companies’ revenue and growth. 21st hopes The Simpsons will draw viewers to FXX, as the channel has had a mixed ratings performance thus far. While shows like veteran It’s Always Sunny In Philadelphia have done well since moving from FX, others – like the recently-canceled Totally Biased with W. Kamau Bell had been ratings disasters. Message board reaction to The Simpsons‘ FXX deal has been mixed -while many are happy to see more Simpsons on the schedule, others are griping that their cable bill could go up as a result, since these big mega-deals generally are passed on to the consumer. FXX is also still unavailable in some areas and is part of a special tier in a few cable packages. A few also were glad to see The Simpsons not going to Adult Swim, as viewers are already complaining about too much off-Fox material on the channel. 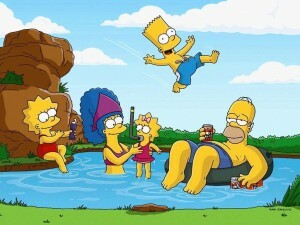 Now in its 25th season and renewed for a 26th, The Simpsons air Sundays on Fox at 7 p.m. Syndicated reruns can be found at 6 p.m. weeknights on WFLD-TV and at 9 and 9:30 p.m. on sister station WPWR-TV, a My Network TV affiliate.